What are the requirements to join an English Free Mason lodge in Johannesburg, South Africa? You must be over the age of 21 or a Student of 18 so you will need to ask. 2. April 1954 Bro. J.W. Anderson Founder - 1950 First S.D. 13. August 1969 Wor. Bro. T.W. Jauncey P.A.D.G.Std.Br. Founder - 1950 Charter S.W. 18. 25 April 1972 Wor. Bro. C.S. Dart P.D.G.W. Hon Member 18|01|1972 Charter J.W. 22. 14 April 1974 Wor. Bro. H.B. Ward P.D.G.Std.Br. Founder - 1950 First Asst. Secy. 27. 3 January 1976 Wor. Bro. E.R. Dwelley P.D.G.Std.Br. Founder - 1950 First Dir. of Cer. 49. 23 November 1994 Wor. Bro. C.R. Hulbert P.D.J.G.W. Didnt want to be Steward. 60. 14 July 2013 Wor. Bro. Carl A.S. Hamel P.A.G.D.C. PGSwdB 2001Worshipful Master for the first time, in our Lodge, in 1968-69 and again in 2008-09 which year, incidentally, marked a period of 40 years as the anniversary of his first time serving as the WM. He eventually went on to achieve high office in our District serving as Assistant District Grand Master for a number of years and ultimately becoming the Deputy District Grand Master of the District Grand Lodge of the Transvaal which honour in our District afforded him the Rank, through the appointing by the Grand Master, the MW Grand Master of the United Grand Lodge of England, His Royal Highness the Duke of Kent, of PGSwdB.He served as Deputy District Grand Master from 2000 to 2004 and as Deputy Grand Superintendent in the Royal Arch from 1994 to 2000. He also served as Inspector General of the District of South Africa, North east in the Rose Croix from 1998 to 2006. He was also the Treasurer of the South African Branch Council of the Rose Croix for many years. My name is John Mucklow from Melrose Lodge and I have been asked to say a few words. I’ve known David personally since 1993 and in recent years stayed on the same farm so have included a few personal reflections. Firstly, thank you to the family for agreeing to include this tribute. On behalf of Melrose Lodge may I extend to you the most heartfelt condolences on your terrible loss. Please know that everyone here today is shocked and devastated, understands your ordeal and shares in your grief and mourning. 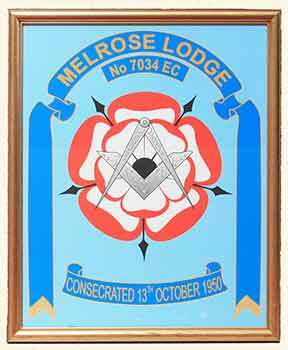 Melrose Lodge is where David was initiated to Freemasonry in the year 2000 and he was master of that lodge in 2006-7. He went on to pursue a vigorous Masonic career. During his time he was an active member of both the Holy Royal Arch Order, and the Mark Master Masons Order, as well as the Order of the Secret Monitor and the Operatives side degree. Well respected and highly thought off, he became a District Grand Standard Bearer and this year was District Assistant Grand Secretary. He was my proposer for both Melrose and Prosperity Mark Lodges. Freemasonry was not just an abiding interest in his life, he was passionate about it. District responsibilities require travel and the visiting of the many of the Lodges in the District and he was meticulous in the tireless discharge of these duties. We will miss his loyal and steadfast demeanour and dedication. There will be an opportunity at the end of this service for masons to pay a final tribute, which is a traditional symbolic gesture, that of laying a sprig of acacia, which is an evergreen, to mark the grave of the recently deceased. A Book of Remembrance is read every year at the January meeting of Melrose Lodge. Sadly, David’s name will be added to those who have served the Lodge so well and passed on to the Grand Lodge Above. David had some subtle qualities and understood some subtle things. He knew that the ability to keep secrets is a test of character. No one could keep a secret better than David. A man must show he can be trusted with little before he can be trusted with much. He was a patient man and patience is the beginning of wisdom. He had kindness in him and kindness is the beginning of love. David had a great sense of humour. He appreciated a good joke and could tell one too. Sometimes his material was a little dusty and this was one of his several charming eccentricities. We at Melrose got used to seeing him at our croquet day functions in his white Panama hat. Croquet brought out his competitive side as did chess also. He died tragically as a brave unarmed man defending his property. A life certainly interrupted, possibly unfinished. The light of a master mason is but darkness visible, not very bright, shaded by a mysterious veil which the eye of human reason cannot penetrate unless assisted by that light which is from above. Let us be careful to perform our allotted task while is yet day. Some of you may remember the Fall Inn, a restaurant near Lanseria airport which he started and ran for some years. During its time it served many bush pilots of the era with what were fondly called ‘last blasts’. He often enlivened our festive board with these, together with his jokes of course, and I hope when you leave here today you will find an opportunity to raise your glass to him and drink one more ‘last blast’. David would have liked that. The period after the Second World War saw rapid development of the northern suburbs of Johannesburg, and the new residents included many immigrants from overseas. The sponsoring Lodge, Woodlands, had as members some outstanding members of the Craft, including Jack Folly - an Assistant Grand District Grand Master from 1949 - and two brothers, Pieter and John Roos, who were beginning to make what became major marks in the District. So circumstances favoured the establishment of a new lodge, with Jack Folly as the Charter Master. 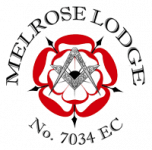 First thoughts of naming the Lodge after RW Bro Vernon Fairbrass could not be realised, but it was his suggestion that it be called after the suburb of Melrose, where he had lived for over 20 years. The lodge crest, representing the red and white Tudor Rose of England was designed by an early joining member, Gordon Fisher. Shortly after the lodge was formed the 'Woodlands' Masonic Hall in Parktown North was substantially extended, and Melrose Lodge met there until 1992, with the ladies providing the festive board. The lodge made satisfactory progress, and was always supportive of the District, not only in charitable effort but in providing active officers. These have included - apart from Jack Folly and Pieter Roos - Dion de Beer, a 'chainbearer' from 1989 and holder of senior offices in the Royal Arch. 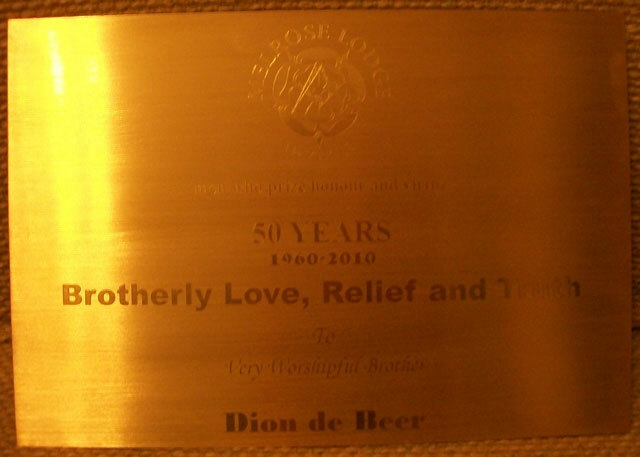 As the years passed the lodge drew its membership from a wider environment, and this was probably an influencing factor when - in the hope of reducing costs - the somewhat controversial decision was made, in 1992, to move to the Masonic Hall in Modderfontein.